Welcome to the Physics Department at Southern Illinois University at Edwardsville! In Physics we seek to explain how the world works, studying the basic "building blocks" of the universe and the laws which govern their interactions. Physics encompasses not only everyday phenomena such as forces, gravity, electricity, magnetism, heat, and light, but also more "exotic" topics ranging from the structure of the atom to the motions of the planets to the history of the universe. The SIUE Physics Department offers a full spectrum of courses ranging from courses suitable for non-science majors through upper-level physics courses. 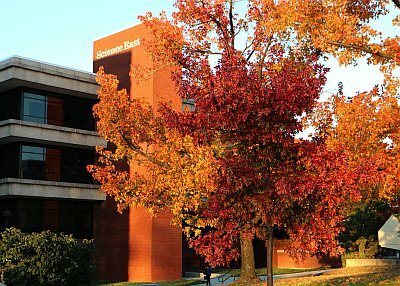 The Department offers an undergraduate (B.S.) degree program, a minor program, and a wide range of courses of general interest for all students. Class sizes are small and students have ample opportunity to interact with the faculty and engage in research projects. Research is being actively carried out in various fields of physics, including in particular Optics and Photonics, Computational and Condensed-Matter Physics, and Physics and Astronomy Education. The Department also conducts public astronomical viewing sessions and engages in other outreach activities for the community. The Physics Department and STEM center held an outreach activity for Nelson Elementary second graders. The students learned about solar system proportions and had a chance to observe the sun using a solarscope and filtered telescope. The lesson was lead by Dr. Ackad. Dr. Ackad recently received continuing funds for his Air Force Office of Scientific Research Young Investigaror Program, Understanding Laser-Cluster Interactions in the X-ray Regime. This article profiles Dr. Ackad's research and the Physics students in his research group. Valerie Becker has been awarded the 2017 Ernest Coleman Memorial Award! The award is for ‘For outstanding Scholarship and Citizenship'. Congratulations to Valerie! Valerie Becker has been admitted as a participant in the Science Undergraduate Laboratory Internship (SULI) sponsored by the Department of Energy (DOE) to work during the three months of the 2017 summer at the Stanford Linear Accelerator Center (SLAC). She will be using terahertz radiation to measure conductivity in warm dense matter. Working under the direction of Dr. Siegfried Glenzer and Dr. Mianzhen Mo, Valerie will work to develop a novel class of experiments using high-power lasers. Valerie has been working with Dr. Ackad since December 2015. Justin Deterding was invited back as a summer intern as part of the Science Undergraduate Laboratory Internship (SULI) sponsored by the department of energy (DOE) for the summer of 2016. He will return to ORNL to work with Dr. Benjamin Lawrie, a member of the Quantum Computing and Sensing division. 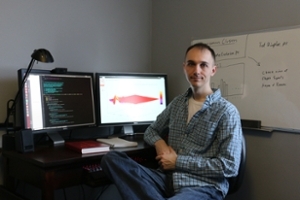 In the lab of Dr. Lawrie, Justin will work with fellow interns to implement squeezed states of light to make measurements below the quantum shot noise limit. Justin has been working in Dr. Garcia's lab. Dr. Ackad's project UltraIntense X-ray laser-matter interaction studies has been chosen to receive a student internship award. The award will further Dr. Ackad's research into heterogeneous clusters and their interaction with ultraintense laser pulses. Valerie Becker has been chosen as the Student Intern and will receive a monetary honorarium and a 2-week HPC training course at the Petascale Institute at NCSA. 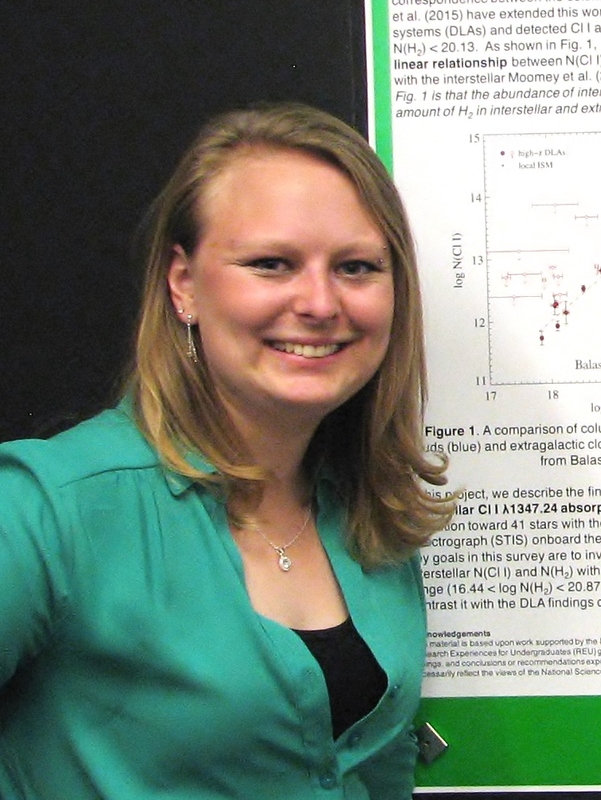 Valerie Becker has been admitted as a participant in the Research Experiences for Undergraduates (REU) program sponsored by the National Science Foundation (NSF) to work during the three months of the 2016 summer in the Center for Interdisciplinary Exploration and Research in Astrophysics (CIERA) at Northwestern University. Her project will involve spectroscopic studies of the Galactic interstellar medium with the Hubble Space Telescope. She will be working under the direction of Dr. Dave Meyer and PhD student Cody Dirks. Valerie has been working with Dr. Ackad since December 2015. Kasey Barrington has been admitted to participated in the Science Undergraduate Laboratory Internship (SULI) sponsored by the department of energy (DOE) to work during the three months of the 2016 summer at the Stanford Linear Accelerator Center (SLAC). He will be systematically associating the gamma-ray sources from the Fermi-LAT survey to the sources from the combined survey of Swift/BAT and INTEGRAL/IBIS (SIX survey) of X-rays. This will allow him and the team to associate and identify yet unknown gamma-ray sources. Kasey has been working in Dr. Ackad's lab since May 2014 (see below). Justin Deterding was accepted as a summer intern as part of the Science Undergraduate Laboratory Internship (SULI) sponsored by the department of energy (DOE) for the summer of 2016. Justin will work in the lab of Dr. Ying-Zhong Ma, in the Chemical Sciences directorate at Oak Ridge National Labs (ORNL). Under Ma, Justin will look into possible laser annealing processes, to increase the efficiency of organic based solar cells. In addition, he will work with other interns to study photoinduced structural changes in Phosphorescent Molecular Butterflies. Justin has been working in Dr. Garcia's lab. 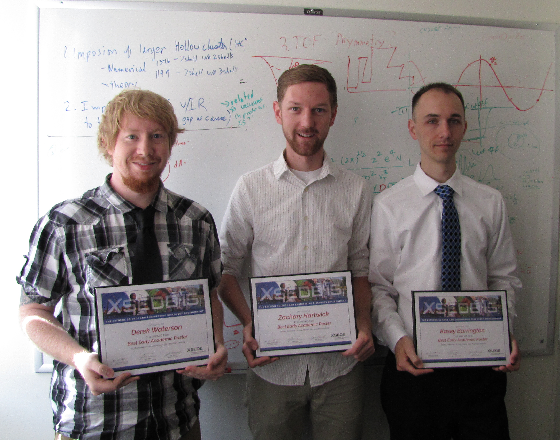 Physics Major Zachary Hartwick (middle) displays his Best Early Academic Poster award from the international conference XSEDE15 for his senior assignment, "Heterogeneous Layered Clusters Irradiated by an Ultra-Intense Resonant X-ray Laser". Also shown are Physics Major's Derek Waterson (left) and Kasey Barrington (right) who contributed to the project as part of Dr. Ackad's Air Force Office of Scientific Research's Young Investigator Research Program. 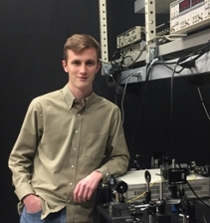 SIUE Physics Major Alex Daykin was accepted to the University of Missouri-Columbia in the Condensed Matter Physics PhD Program. Congratulations Alex! 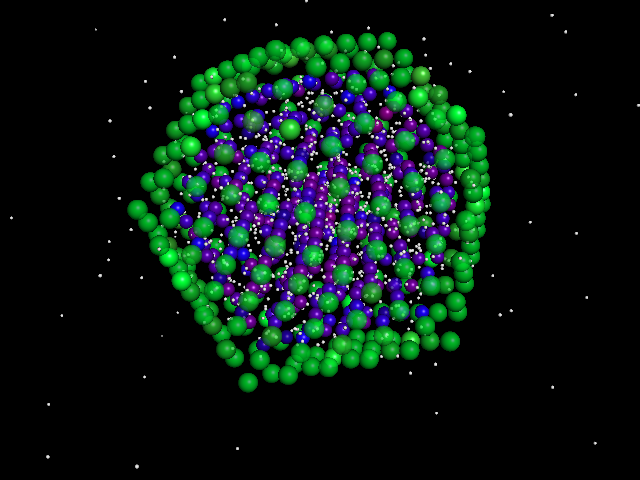 Dr. Ackad has been award 5000 hours of supercomputing time on Anton the fastest (public) molecular dynamics computer specializing in biomedical problem, for his collaborative project (with Dr. Yousef), "Determining the Motion of a Molecular Nano Bio-Switch". This will give physics students working with Drs. Ackad and Yousef High Performance Computing (HPC) training and allow them to continue to publish world class biophysics research and nanoengineering. Dr. Yousef recent took time away from the lab to go on national TV in Egypt and explain his research on understanding the drug resistivity in the Egyptian strain of the hepatitis C virus. In the interview Dr. Yousef explains how he investigates the different resistivities of the hepatitis C using high performance computing (in collaboration with Dr. Ackad) and experimental molecular biology. Dr. Ackad has been award nearly 20000 hours of supercomputing time on Blue Waters, the fastest computer on a university campus, for his collaborative project (with Dr. Yousef), "Testing the convergence of Advanced Methodologies for Biomolecular Measurements of Hepatitis C’s Nonstructural Protease 3". This will give physics students working with Drs. Ackad and Yousef High Performance Computing (HPC) training and allow them to continue to publish world class biophysics research. This is in the office wing of the basement of the Science East building.